We refinished a bedroom dresser this weekend! It was quite the adventure. I’ve longed to refinish this dresser for awhile now, along with the mismatched assortment of side tables we’ve gathered along the way (the overall look of which was less “charmingly eclectic” than “indoor yard sale”). 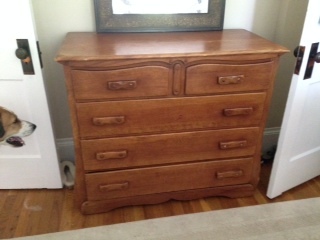 The dresser dates all the way back to my father-in-law’s bachelor days, and he bought it secondhand even then. (He thinks it may have been part of a room with a “cowboy theme” before it was his (???) I didn’t ask what that meant. ) It’s solid maple, which is awesome. 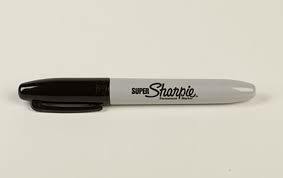 But it was stained (varnished? shellacked?) with some product that had turned orange over the years. As much as I love a nice orange handbag, orange as a wood color is not my thing. Also, parts of the dresser were sticky, where the coating had just sort of bunched up in places, and there were coffee stains and ring marks (which I jokingly blame on my coffee-loving father-in-law, but I’m pretty sure date back only to me.) So this weekend, with clear skies and sun in the forecast, we dragged that heavy beast out into the driveway and prayed inspiration. -Anyone who refinished anything before the invention of the electric sander is a hero. Holy guacamole, what a process. -Even an electric sander leaves your entire arm vibrating for a full fifteen minutes after you’re done. -Spray painting outside on a windy day is a great way to get that natural “textured” look, as just as you finish painting, a nice fresh layer of bugs, dried leaves and dog fur will blow by to rough up all your smooth, newly-sanded surfaces. 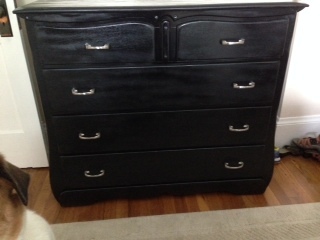 This entry was posted in Home and tagged DIY, Refinishing furniture, Sharpie on July 14, 2014 by Trish Ryan.